As you may know, October 31st is Halloween. Even in Japan, its popularity has been getting bigger and bigger. The economic benefits from Halloween are enormous now. 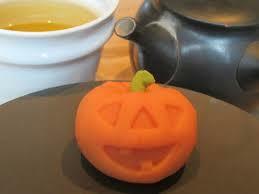 As you may not know, October 31st is the day of Japanese tea. Until recent, I didn’t know that…..Oops!! According to my humble research, October 31st (the New calendar) is considered the day when Eisai, a Japanese Buddhist priest returned to Japan from Sung (the current China) in 1911. It is believed that he brought back some tea seeds and the cultivation method. That’s why the day is set as Japanese tea day. Why don’t the shop take advantage of well-known event?? They do…..under the slogan “Trick or Tea!” The day of Japanese tea has nothing to do with Halloween, but I like “treat”, and “tea” too.